Civilian pilots communicate with ATC on frequencies in the very high frequency (VHF) range between 118.000 and 136.975 MHz. To derive full benefit from the ATC system, radios capable of 25 kHz spacing are required (e.g., 134.500, 134.575, 134.600). If ATC assigns a frequency that cannot be selected, ask for an alternative frequency. Figure 2-1. Typical navigation/communication installation. Figure 2-1 illustrates a typical radio panel installation consisting of a communications transceiver on the left and a navigational receiver on the right. 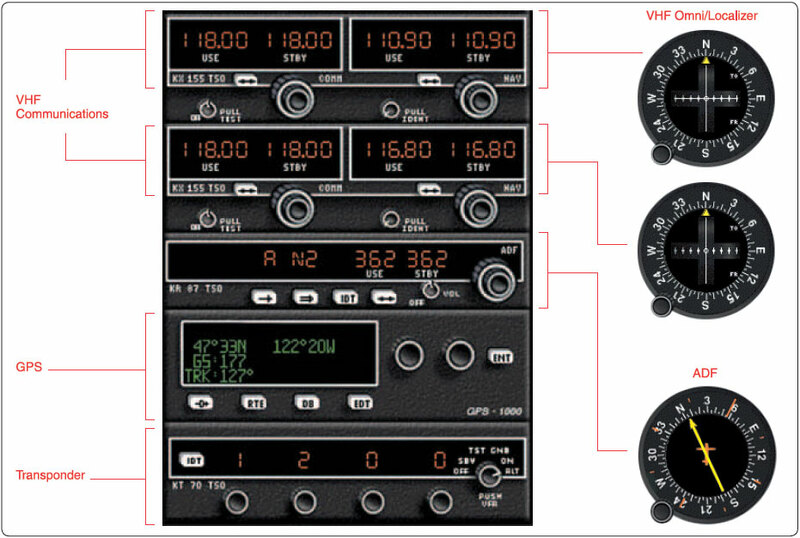 Many radios allow the pilot to have one or more frequencies stored in memory and one frequency active for transmitting and receiving (called simplex operation). It is possible to communicate with some flight service stations (FSS) by transmitting on 122.1 MHz (selected on the communication radio) and receiving on a VHF omnidirectional range (VOR) frequency (selected on the navigation radio). This is called duplex operation. An audio panel allows a pilot to adjust the volume of the selected receiver(s) and to select the desired transmitter. 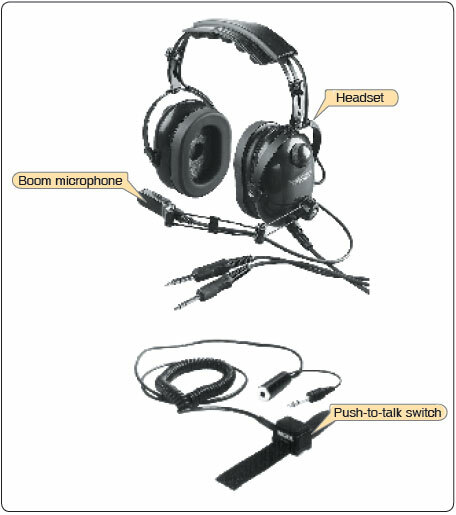 [Figure 2-2] The audio panel has two positions for receiver selection, cabin speaker, and headphone (some units might have a center “OFF” position). Figure 2-3. Boom microphone, headset, and push-to-talk switch. Switching the transmitter selector between COM1 and COM2 changes both transmitter and receiver frequencies. It is necessary only when a pilot wants to monitor one frequency while transmitting on another. One example is listening to Automatic Terminal Information Service (ATIS) on one receiver while communicating with ATC on the other. Monitoring a navigation receiver to check for proper identification is another reason to use the switch panel. Most audio switch panels also include a marker beacon receiver. All marker beacons transmit on 75 MHz, so there is no frequency selector. Figure 2-4 illustrates an increasingly popular form of navigation/communication radio; it contains a global positioning system (GPS) receiver and a communications transceiver. Using its navigational capability, this unit can determine when a flight crosses an airspace boundary or fix and can automatically select the appropriate communications frequency for that location in the communications radio. Figure 2-4. Combination GPS-com unit. ATC radars have a limited ability to display primary returns, which is energy reflected from an aircraft’s metallic structure. Their ability to display secondary returns (transponder replies to ground interrogation signals) makes possible the many advantages of automation. A transponder is a radar beacon transmitter/receiver installed in the instrument panel. ATC beacon transmitters send out interrogation signals continuously as the radar antenna rotates. When an interrogation is received by a transponder, a coded reply is sent to the ground station where it is displayed on the controller’s scope. A reply light on the transponder panel flickers every time it receives and replies to a radar interrogation. Transponder codes are assigned by ATC. When a controller asks a pilot to “ident” and the ident button is pushed, the return on the controller’s scope is intensified for precise identification of a flight. When requested, briefly push the ident button to activate this feature. It is good practice for pilots to verbally confirm that they have changed codes or pushed the ident button. Primary radar returns indicate only range and bearing from the radar antenna to the target; secondary radar returns can display altitude, Mode C, on the control scope if the aircraft is equipped with an encoding altimeter or blind encoder. In either case, when the transponder’s function switch is in the ALT position, the aircraft’s pressure altitude is sent to the controller. Adjusting the altimeter’s Kollsman window has no effect on the altitude read by the controller. Transponders, when installed, must be ON at all times when operating in controlled airspace; altitude reporting is required by regulation in Class B and Class C airspace and inside a 30-mile circle surrounding the primary airport in Class B airspace. Altitude reporting should also be ON at all times. Figure 2-5. Phonetic pronunciation guide. ATC must follow the guidance of the Air Traffic Control Manual when communicating with pilots. The manual presents the controller with different situations and prescribes precise terminology that must be used. This is advantageous for pilots because once they have recognized a pattern or format, they can expect future controller transmissions to follow that format. Controllers are faced with a wide variety of communication styles based on pilot experience, proficiency, and professionalism. Pilots should study the examples in the AIM, listen to other pilots communicate, and apply the lessons learned to their own communications with ATC. Pilots should ask for clarification of a clearance or instruction. If necessary, use plain English to ensure understanding, and expect the controller to reply in the same way. A safe instrument flight is the result of cooperation between controller and pilot.